Up to 41 civilians were allegedly killed and 53 injured in an airstrike on Hawijah which was said to have struck the city’s main market and hospital. 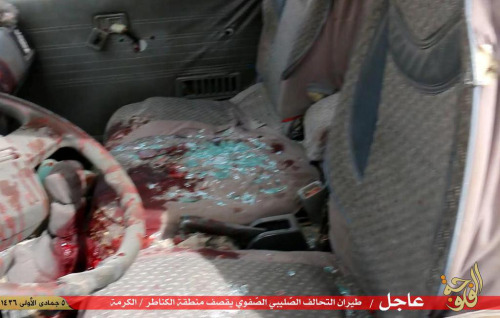 The Daesh-linked Al A’amaq Agency initially reported the “Killing of four [civilians] and the wounding of 10 – most of them women and children – in an air strike targeting a market in the town.” Subsequent reports said the town’s main hospital was also targeted – and was “completely destroyed” according to one source. Mass casualties were claimed. Some local sources claim the event was an act of ‘revenge’ following the earlier shooting down of an Iraqi military aircraft. 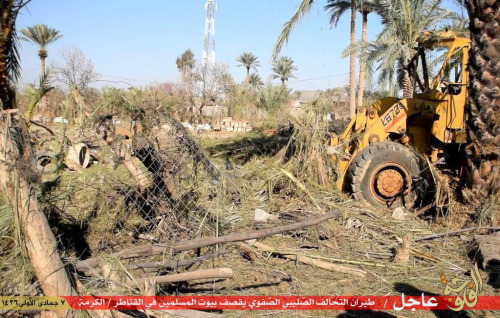 A Daesh propaganda video titled ‘Iraqi Air Strikes on Hospital’ showed extensive destruction and casualties. Only after the reported strike on the hospital did local media begin blaming the Coalition, insisting there were as many as 100 civilian dead and injured. 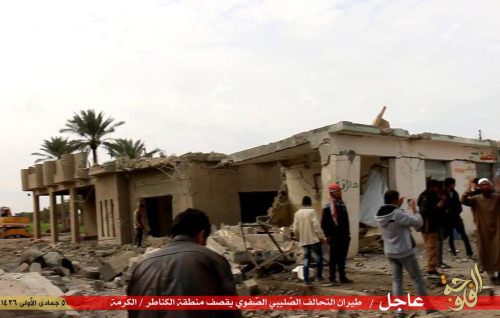 One source – Dijlah TV – claimed the event was a jont Iraqi-Coalition raid which had mistakenly bombed the hospital. A high-ranking officer with the Iraq Army was the reported source for a highly contested claim – most likely Daesh propaganda – that French aircraft had bombed a school in Mosul, allegedly killing 28 pupils. France subsequently confirmed that its aircraft had carried out a 9.30pm airstrike near Mosul the evening before, on November 24th, telling Middle East Eye that “At 19:30 French time [21:30 local time] four Rafale fighter jets from an aircraft carrier stationed in the eastern Mediterranean, along with some US aircraft, dropped 20 bombs on an IS command centre“ at nearby Tal Afar. Up to 25 internally displaced Iraqis were reported killed in Zankura following alleged Coalition strikes and Iraqi government shelling. 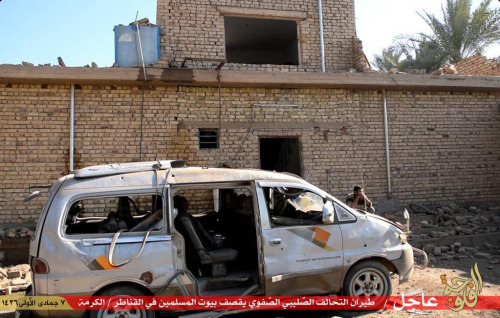 Iraqi Revolution reported the martyrdom of at least 25 civilians, mostly women and children, in a massacre by the international Coalition and [Iraqi] government aircraft following the bombing of the home of Saleh Hajji at Zankura, northwest of Ramadi, which was being used by a number of homeless families. It was reported by several sources in Hit that Coalition or Iraqi jets struck a number of civilian houses, killing up to 22 persons. Eight children and 3 women were reportedly among the dead. The UN cited the attack in its quarterly report, noting that: “On 6 October, an air strike allegedly hit civilian buildings in Heet [sic], killing at least 18 civilians (including three women and eight children), with an undetermined number of wounded. 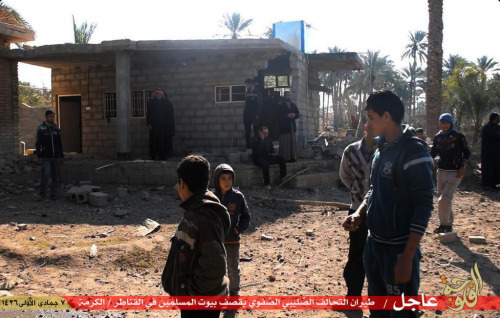 Other sources, however, reported that the target of the air strike was ISIL, and that the three civilian houses had been hit with resulting civilian casualties in subsequent shelling of the area.” The UN attributed the attack generally to Iraq and its allies – including possibly the coalition. 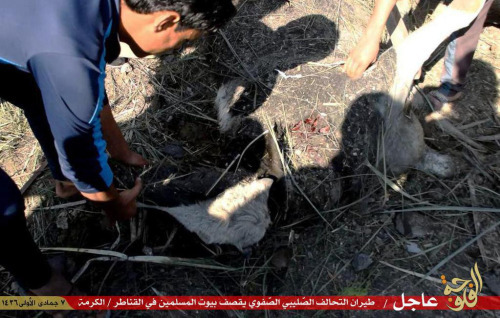 Graphic images allegedly showing children killed in the Hit incident emerged on October 6th. These were later used for anti-Assad propaganda purposes in Syria, for example for October 26th 2014. Responding to allegations of civilian casualties at Hit, CENTCOM internally reviewed all records of strikes on the town between October 1st and October 5th 2014. According to a report declassified in August 2015, “No strikes IVO [in vicnity of] Hit struck any civilian structures.” Based on information presently available, it appears likely the strike was the work of Iraqi aircraft. Al Jazeera Arabic shows footage of destruction in HIt (0’20”), speaks to a local dignitary and blames both Iraqi and coalition planes. CCA JOC reviewed all strike reports IVO Hit between 1 Oct 14 to 6 Oct 14. No strikes ICO Hit struck any civilian structures. All strikes IVO Hit during the potential DTG were conducted against either PID ISIL fighters or equipment, to iNlude vehicles. All strikes IVO Hit during the potential DTG were observed by CC JOC personnel on ISR feeds. Euphrates Post reported that 20 civilians died and 30 were wounded “as a result of an air raid by mistake targeting the perimeter of Al-Fateh Mosque yesterday evening”. It blamed the regime. 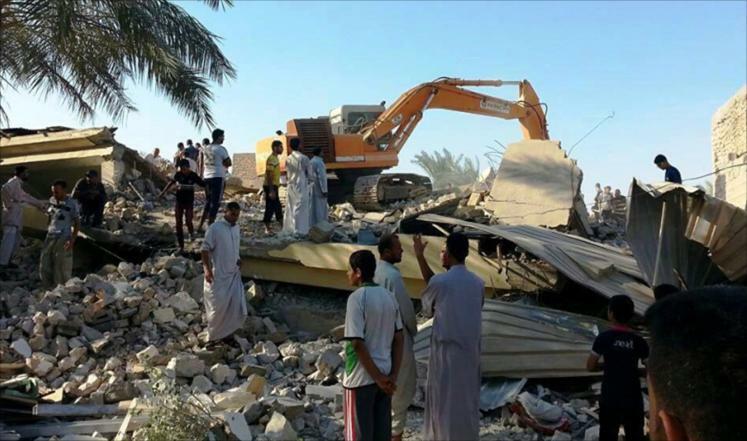 However, Al Ahed blamed the Coalition, putting the death toll at 14 with 32 more wounded. Reuters published a report in which the Coalition denied responsibility. It said: “Syrian state television had said the U.S.-led coalition hit the government-held Qusur district, killing 14 civilians and wounding 32, on Monday. The British-based Syrian Observatory for Human Rights said it was unclear which aircraft carried out the raid, but that it killed at least 22 people. Colonel Ryan Dillon, a spokesman for the US-led coalition against Islamic State, said that its jets had not conducted air strikes on any part of the eastern city. The coalition says it investigates any such allegations and was careful to avoid civilian casualties in its bombing runs in Syria and neighbouring Iraq. According to the Syrian Observatory, “confirmatory sources [reported] that the international coalition’s warplanes targeted areas in al-Nawajah village located to the east of Manbij city in the northeastern countryside of Aleppo. The airstrikes killed and injured 15 people at least, and some of the wounded are still in dangerous situation.” Manbij Documentation Agency placed the death toll at 15, while Manbij Mother of All the World reported up to 20 casualties – but said getting information was proving difficult because of an “unprecedented media blackout.” Manbij Direct said 10 died with 15 injured. It listed some of the dead. Local media and the area’s MP reported that 20 civilians were killed and 55 injured after unknown aircraft targeted Al Baaj city west of Mosul. According to Zahid Kotuna, the elected MP for the area, an unknown warplane carried out a fierce air strike on the densely populated civilian town of Baaj 140 km west of Mosul. The bombing caused the deaths of 20 civilians, including children, and the wounding of about 55 others. Iraqi Spring said that More than 20 civilians were killed and dozens injured as an aerial shelling targeted Sina’a Marketplace in Ba’aj district west of Mosul. In its February 2017 civilian casualty report, the Coalition stated that it was not responsible for the event: (7.) Dec. 25, 2016, near al-Ba’aj, Iraq, via media report: No Coalition strikes were conducted on that day in the geographic area of the reported civilian casualties. No Coalition strikes were conducted on that day in the geographic area of the reported civilian casualties. 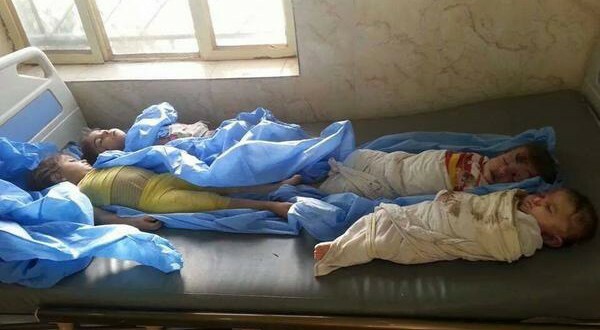 Seven civilians from one family – including young children – were killed and 8 injured when a house was allegedly struck by a coalition aircraft. 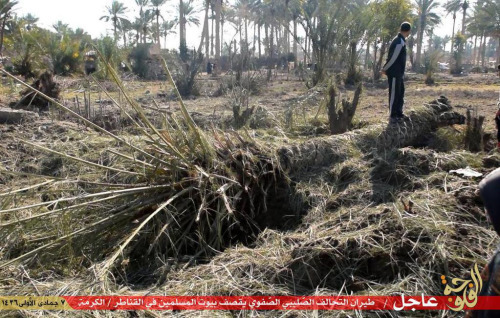 However other sources attributed the attack to an artillery assault by the Iraq Army. The dead were later named by the Iraqi Spring Centre. Seven additional people were named as severely injured in the event. In a later report, Baghdad TV claimed that as well as ‘a family of six’ killed in the strike, an additional 14 civilians had died after a total of seven homes were struck. 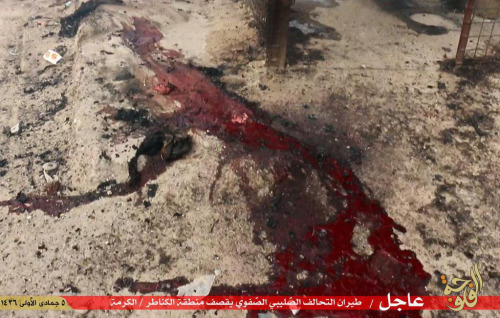 Open source media report that the hospital source in al-Qaim, a town on the Euphrates River, hospital said nine civilians were killed and 29 militants were wounded in the strike by the U.S.-led coalition. Some of the wounded were taken across the border to Syria for treatment. / OSINT RPT record via CHOPS. Target identified as an insurgent meeting house/staging house, and was not a hospital.